A 9.0-magnitude earthquake struck Japan offshore on March 11, setting into motion a tsunami that engulfed large parts of northeastern Japan and triggered a nuclear meltdown at a power plant in Fukushima. 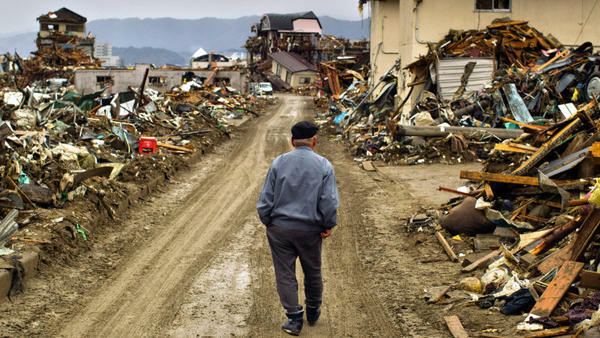 On March 26, a man walks among debris in Rikuzentakata, Iwate Prefecture, Japan. 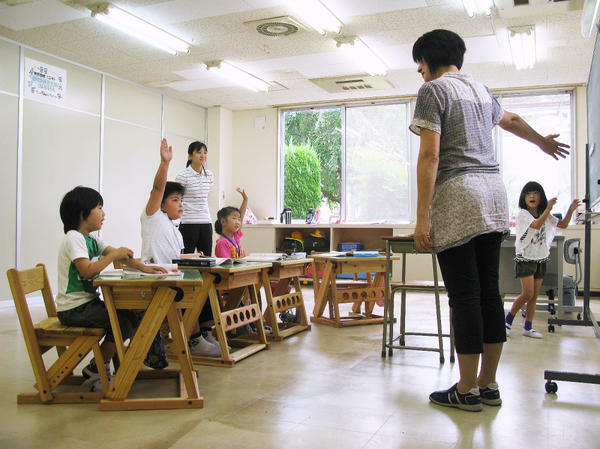 Four first-grade students study at the Tomioka Town Joint Temporary School. The school, housed into a soon-to-be-abandoned auto parts factory, is home to refugee pupils from Fukushima prefecture's radiation zone. 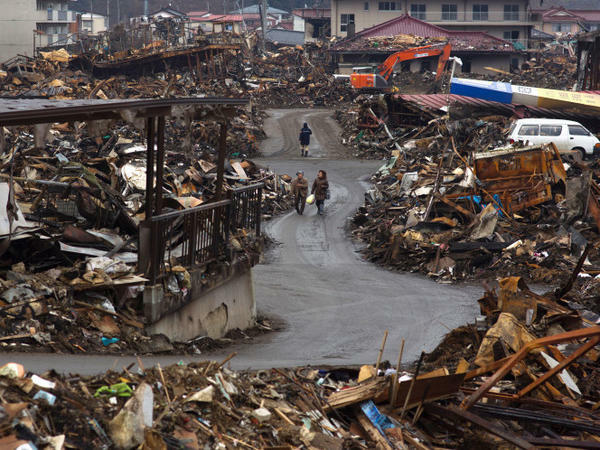 Local residents walk among debris in Kesennuma, Japan, on March 31, just weeks after the quake and tsunami. Miyo Tatebayashi used to live about three miles from the Fukushima nuclear plant, which suffered a crippling accident when the March 11 tsunami struck Japan. On a recent day, she had just returned from a government-organized trip to the radiation zone in Fukushima prefecture along Japan's northeast coast. She had wanted to see her house. "When I got out of the bus with my daughter, we were smiling. 'It's there,' " she recalls saying. "But when we actually saw our place, I thought, 'Oh, there is no way.' "
The tsunami had washed her home away, and the nuclear disaster had irradiated her land. The radiation levels are so high, the government says, that parts of Tatebayashi's hometown, Futaba, may be off-limits for 20 years. Tatebayashi says she now realizes her life as she has known it is over. "Now I've given up," she says, crying as a friend comforts her by patting her neck. "I've finally accepted it." Six months after the Fukushima meltdown, the Japanese government says eight areas could be too dangerous for humans to live over the next two decades. Outside the evacuation zone, most people have decided to stay, but many still worry about elevated radiation levels. And as a new semester began, thousands of students in Fukushima City arrived in class wearing government-issued radiation monitors. These days, Tatebayashi lives on the outskirts of Tokyo in an abandoned high school, which serves as an evacuation center for 900 nuclear refugees. One of them, Yutaka Yoshioka, ran a cosmetics and clothing shop near the reactors. On a recent evening, he picked up his boxed dinner, which included fried ham, a dumpling and bottled water. Yoshioka says life at the center is excruciatingly dull. "In the morning, boxed meal. Boxed meal for lunch, boxed meal for dinner," he says, wearily. "Since I have no job, I'm just being lazy, lying around watching TV." Yoshioka shares a high school athletic room with 40 people. There's no privacy: Young women dress behind cardboard boxes. Yoshioka marks the days by the movies he watches. He's worked his way through four of the Rocky films. The government has closed most of the major evacuation centers and resettled people in apartments and temporary homes. When his center closes, Yoshioka doesn't know what he'll do. At 63, he doubts he can find a job. "I'm too old, so it is impossible," says Yoshioka, who wears blue shorts, a white T-shirt and rubber sandals. "I can't adapt to a place like here." People who lived a safer distance from the reactors have returned to their routines. In Fukushima City, about 40 miles from the nuclear plant, schools are open and people go to work, but just below the surface there is uncertainty and some fear. The local government has decontaminated many schools. Radiation levels are down, but still higher than normal. Seiichi Ishizaka, who works in the construction business, has an 8-year-old daughter and has thought about leaving. "I thought it might be dangerous for my child," says Ishizaka, "but there are still so many people that are living here, so I am kind of watching the situation." On the other hand, Ishizaka's wife, Hiroko, wants out. "I think the government isn't doing enough," she says. "I would leave Fukushima if I could. But I have a house and a job." The couple is spending a warm Sunday afternoon indoors at a community center because they don't want their daughter, Chitose, exposed to the higher radiation levels outside. Chitose runs around the community center by herself; a small, pink box swings from a cord around her neck. It's one of 26,000 radiation monitors the Fukushima City government gave students recently. The devices will measure radiation exposure for each child over the next several months. But parents say they're confused because the government still hasn't told them what it considers a safe level of radiation for children. "I just don't know what this is useful for," says Hiroko Ishizaka. "Even if I'm told, 'Your kid had this level of radiation,' I can't see whether it means it's safe or not." This has been a common complaint since the disaster. People say the government is slow to reveal information and explain things. Neither the Fukushima City Education Committee nor the disaster management office could provide a safety standard for the radiation monitors. City officials say it is up to the national government to set them. A radiation monitor showed the level of radiation outside Fukushima City Hall was 1.09 microsieverts per hour. Using a Geiger counter, an NPR reporter found similar readings around town. A microsievert is a dose of radiation, but what danger — if any — does it pose? Steve Simon is a radiation physicist at the U.S. National Institutes of Health in Bethesda, Md. "One microsievert per hour, in my view, is not terribly large," says Simon, adding that 1 microsievert isn't dramatically higher than the level of radiation that occurs naturally, and has never been shown to cause cancer. "We're talking just a few times larger than background radiation," he says. "Whereas, all the studies that have been found to have effects have been hundreds or thousands or ten of thousands of times." Would Simon feel safe living in Fukushima City? "I would not have any hesitation about staying there, based on that single bit of information," he says. "That radiation level would not frighten me." At the Tomioka Town Joint Temporary School, teachers gather each morning to meet students as they get off the bus. The greeting is unusually warm because this is an unusual school. The students used to live in the town of Tomioka, which is near the nuclear plant and is now a no-go zone because of radiation. Teachers spent the summer creating a replacement school in the town of Miharu, about 30 miles from the reactors. Most Tomioka students have scattered since the meltdown, but 75 have returned. The school is housed in an auto parts factory that's soon to be abandoned. In seventh-grade English, the students — there are only eight — recite their lessons: "I like baseball, but I don't like volleyball." The girls wear the school uniform, a navy blue skirt and sailor's blouse with a neckerchief. Yukio Nishiyama is a skinny 13-year-old. He says that after the disasters last spring — earthquake, tsunami, meltdown — it's nice to be with kids he knows from home. "Very simply: I'm so glad," says Nishiyama. "We are back together again, studying together." OK. It's been six months now since Japan was hit by a devastating earthquake, which triggered a tsunami and nuclear meltdown at the Fukushima Dai-ichi power plant. The Japanese government has now declared eight areas too dangerous to live in for the next two decades. Outside the evacuation zone, most people have decided to stay, but many still worry about elevated radiation levels. NPR's Frank Langfitt reports on what life is like for those who have made that decision, and for those who can't go home. FRANK LANGFITT: Miyo Tatebayashi has just returned from a government-organized trip to the radiation zone. She wanted to see her house, which stood about three miles from the nuclear plant. MIYO TATEBAYASHI: (Through translator) When I got out of the bus with my daughter, we were smiling and like, yeah, it's there. But when we actually saw our place, I thought, oh, there is no way. LANGFITT: The tsunami had washed her home away, and the meltdown had irradiated her land. So much so, the government says parts of Tatebayashi's hometown, Futaba, may be off-limits for 20 years. Tatebayashi says she now realizes her life as she has known it, is over. TATEBAYASHI: (Through translator) Now I've given up. I've finally accepted it. LANGFITT: Tatebayashi lives in an abandoned high school outside Tokyo. She shares the evacuation center with 900 other nuclear refugees. One of them, Yutaka Yoshioka, ran a cosmetics and clothing shop near the reactors. This evening, he's picking up his boxed dinner - fried ham, a dumpling, bottled water. He says life here is excruciatingly dull. YUTAKA YOSHIOKA: (Through translator) In the morning, boxed meal. Boxed meal for lunch, boxed meal for dinner. Since I have no job, I'm just being lazy, lying around, watching TV. LANGFITT: Yoshioka shares a high school athletic room with 40 people. There's no privacy. Young women dress behind cardboard boxes. Yoshioka marks the days by the movies he watches. YOSHIOKA: (Speaking foreign language) one, two, three, four (speaking foreign language). (Through translator) Yesterday, I watched "Rocky 3." I've watched "Rocky"s 1, 2, 3, 4. And next Monday will be "Rocky 5." LANGFITT: The government has closed most of the major evacuation centers, and resettled people in apartments and temporary homes. When his center closes, Yoshioka doesn't know what he'll do. At 63, he doubts he can find a job. YOSHIOKA: (Through translator) I'm too old, so it's impossible. I can't adapt to a place like here. LANGFITT: People who lived a safer distance from the reactors have returned to their routines. In Fukushima City, about 40 miles from the nuclear plant, schools are open, people go to work. But just below the surface, there's uncertainty - and some fear. The local government has decontaminated many schools. Radiation levels are down but still higher than normal. Seiichi Ishizaka works in the construction business and has an 8-year-old daughter. He's thought about leaving. SEIICHI ISHIZAKA: (Through translator) I thought it might be dangerous for my child, but there are so many people living here. So I'm kind of watching the situation. LANGFITT: Ishizaka's wife, Hiroko, wants out. HIROKO ISHIZAKA: (Through translator) I think the government isn't doing enough. I would leave Fukushima if I could, but I have a house and a job. LANGFITT: The couple is spending this warm afternoon indoors, at a community center. They don't want their daughter, Chitose, exposed to the higher radiation levels outside. So Chitose runs around by herself. A small, pink box swings from a cord around her neck. It's one of 26,000 radiation monitors the Fukushima government gave students recently. The devices will measure radiation exposure for each child over the next several months. But parents are confused. The government still hasn't said what it considers a safe level of radiation for students. ISHIZAKA: (Through translator) I just don't know what this is useful for. Even if I'm told your kid had this level of radiation, I can't see whether it means it's safe or not. LANGFITT: I'm here at Fukushima City Hall, looking at a radiation monitor. And it says that just outside, there's 1.09 microsieverts per hour of radiation. Using a Geiger counter, I found similar levels around town. A microsievert is a dose of radiation. But what danger, if any, does it pose? STEVE SIMON: One microsievert per hour, in my view, is not terribly large. LANGFITT: Steve Simon is a radiation physicist at the U.S. National Institutes of Health. He says one microsievert isn't dramatically higher than the level of radiation that occurs naturally, and he says it's never been shown to cause cancer. SIMON: We're only talking about a few times background radiation, whereas all studies that have been done where they found effects, were hundreds or thousands or ten thousands of times. LANGFITT: Would Simon feel safe living in Fukushima City? SIMON: I would not have any hesitation about staying there, based on that single bit of information. That radiation level would not frighten me. LANGFITT: At the Tomioka Town Joint Temporary School, teachers gather each morning to meet students as they get off the bus. The greeting is unusually warm because this is an unusual school. The students used to live in the town of Tomioka, which is near the nuclear plant - and now a no-go zone because of radiation. Teachers spent the summer creating a replacement school here in the town of Miharu, about 30 miles from the reactors. Most Tomioka students have scattered since the meltdown, but 75 have returned. LANGFITT: The school is housed in an auto parts factory that's soon to be abandoned. Workers are still putting in walls. UNIDENTIFIED MAN: I like baseball, but I don't like volleyball. LANGFITT: This is seventh-grade English. The students - there are only eight - are reciting their lessons. The girls wear the school uniform: a navy blue skirt, and sailor's blouse with a neckerchief. YUKIO NISHIYAMA: My name is Yukio Nishiyama. LANGFITT: Yukio is a skinny 13-year-old. He says after the disasters last spring - earthquake, tsunami, meltdown - it's nice to be with kids he knows from home. NISHIYAMA: (Through translator) Very simply: I'm so glad. We are back together again, studying together. LANGFITT: Maziku Zagara(ph) serves as one of the school's principals. He says after the students lost their homes to radiation, he wanted to give them a connection to the lives they once led. MAZIKU ZAGARA: (Through translator) The fact that we reopened the school here will give emotional support to the kids scattered by the disaster. The fact that the school exists for the kids to return to is meaningful because this is the place where children's hearts can always come back. LANGFITT: The months following the meltdown have been marked by uncertainty and fear. But at the Tomioka School, there is some sense of continuity - and something that looks like a new beginning. Frank Langfitt, NPR News. Transcript provided by NPR, Copyright NPR.